Things we can count on at this time of year: the farmers markets are brimming with produce, the days are a little shorter, the air has started to turn a little cooler, the crickets are chorusing, the Minnesota State Fair is underway and soon Fall classes will start up at Wet Paint. We are excited to bring you a robust season of classes that will support your continuing creative pursuits or perhaps introduce you to new materials or techniques for the first time. You’ll find multi week courses in watercolor and acrylic painting, awakening creativity, italic lettering, drawing animals, urban sketching, and rosemaling; daylong or weekend immersive workshops in folded and ruling pen lettering, collage, gestural watercolor, drawing facial features, oil painting without solvents, direct watercolor, mixed media, and oil paint + cold wax medium , along with many single session classes ranging from book and paper arts to 3D, organizational journaling, brush pen lettering and airbrush. Meet Your Creative Self- “The Artist’s Way” taught by Tara Tieso, Brush Pen Lettering, and Shrink Film Charms classes taught by Kaytee Crawford, Drawing Animals from Photographs taught by Tracie Thompson, Making Watercolors Sing: Split Primary Color Theory taught by Tara Sweeney, and for those continuing in watercolor or acrylics, Watercolor II: Figures in Landscape and Acrylic Painting-Level 2+3 taught by veteran instructors Tara Sweeney and Carl Oltvedt (respectively). From the Pacific Northwest: renowned watercolorist, Ron Stocke and oil painter Angela Bandurka will give a demo and each will teach daylong classes featuring M.Graham Paints (Oregon), Introductory Airbrush featuring IWATA airbrush (also headquartered in Oregon) taught by Rurik Hover; Oil and Cold Wax Medium with R+F Handmade paints (out of New York) taught by the incredibly popular Julie Snidle (from St.Louis); Minneapolis-based instructor Diana Eicher’s Family Print Activity classes with Speedball/Akua printmaking supplies, the pride of Statesville, North Carolina! From Minnesota- Autograph Digital Projectors and Light Pads demo/tutorials with John Davis and Two classes using CAVE handmade paper (from across the river in Minneapolis) –Hand bound Sketchbooks taught by Bridget O’Malley, and Nature Journal: Book Arts and Writing classes taught by Amber Stoner. and the popular monthly Sunday Sketch-In’s with the Bell Museum. With 45+ classes and events, it’s going to be a bountiful and creative fall in the Wet Paint classroom. Hope to see you there! Categories: Events at Wet Paint, Uncategorized | Tags: Classes, events, Virginia McBride, Wet Paint, Wet Paint St. Paul | Permalink. Join us in the Wet Paint classroom on Saturday, October 22nd for a 3 hour mixed media workshop with visiting artist Dana Brown. You will make (and take) two unique mixed media pieces while exploring the potentials of Ampersand’s fantastic panels. The workshop is offered twice – from 10am-1pm and again from 2pm-5pm – choose the one that’s best for you! Mixed media collage allows you to experiment with dynamic compositions while you explore new techniques and materials. The change of approach from more conventional processes is great for generating original ideas that impact both the collage itself as well as your regular drawing and painting practice. Dana is well known for the fun he brings to teaching, as well as his extensive knowledge of artists’ materials. This workshop is suitable for any level of art maker. It would be a great way to expand your experience of using a variety of media on the same surface, or just to try something different. The $48 class fee includes all of the supplies we’ll use in the workshop: an 8×10 Claybord and an 8×10 Encausticbord for each participant, as well as Golden acrylic paints, Claybord/Scratchbord inks and the full line of Scratchboard tools, magazines for collage, drawing supplies, random materials for mixed media techniques, and essential studio supplies like brushes, glue and scissors. Register yourself – or your group – here. Dana Brown is an artist from Austin, TX. He has worked with Ampersand Art Supply for the past nine years educating artists and conservators from all over the world about Ampersand’s innovative contemporary artists’ panels. Dana’s personal art work is in a variety of media, ranging from oil painting to paper collage. Originally from rural Iowa, Dana moved to Portland, Oregon, after completing his degree in studio painting. While there, he spent almost six years with oil paint company Gamblin Artists Colors, before moving to Texas to join Ampersand Art Supply. He loves working in the constantly evolving world of artists’ materials. He finds that this work reinforces his belief that access to information about the materials that we use helps support our personal, artistic intentions. Ampersand Art Supply began hand-making museum quality panels in 1993, with the goal of offering artists rigid, versatile, and permanent supports. Initially beginning with smooth, absorbent Claybord, Ampersand now offers ten different surface options; rejecting the, “one size fits all,” approach to painting surfaces. Ampersand hand-makes museum quality panels in Buda, Texas. Categories: Events at Wet Paint | Tags: Ampersand panels, Classes, collage, Dana Brown, events, Virginia McBride, Wet Paint St. Paul | Permalink. 40 Years of Collaboration: Wet Paint turns 40! From Wet Paint’s humble beginnings as the art supply section of the Hungry Mind Bookstore to the 5000 square foot wonderland of artists’ materials we’ve become, one thing has remained constant: the reason we’re here. Serving one of the greatest creative communities in the world has been our honor and passion for 40 years. As we celebrate this milestone anniversary in October, we simultaneously look forward to the next 40 years of providing the right tools for every artistic expression to the generations of creatives to come. Like seeing some images from Wet Paint days of yore? We’ve made a little gallery of a few old Wet Paint pictures posted here! Kicking off the anniversary festivities will be a month long exhibit of art by Wet Paint staffers at Sencha Tea Bar just next door to Wet Paint. There will be a closing party from 5-7pm on Sunday, October 23rd. We’ve also come up with a number of ways for the community to help us celebrate this momentous milestone. The most eye-catching activity will surely be our “Exquisite Corpse” project. Following in the footsteps of the Surrealists who popularized this chance-based parlor game in the 1920’s, we’ve recruited a variety of artists to create a section of a figure. These sections were collectively assembled to create crazy, mismatched people called Exquisite Corpses. These near life-size artistic creations will grace the front windows of Wet Paint for the month of October. See photos of them on our Facebook page here. Note: want to participate in our Pocket-sized Exquisite Corpse Project? Click here for information on how YOU can get involved! The weekend of October 27-30 is when the celebration kicks into high gear! Look for a variety of family-friendly anniversary events, as well as door prizes, raffles, refreshments, and more! All events are free and open to the public. See the tentative schedule below or check out our Events page on our website for more info. -Collaborative Pocket-sized Exquisite Corpse Project (ongoing through October): draw inspiration from the characters in the windows, or invent your own pocket-sized person! -Want to try printing with a gel plate? It’s easy and fun! 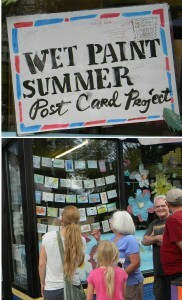 Join Wet Paint staffer, Kate, and create your own monoprint card or artwork. All materials are provided, just bring your sense of creativity and fun! Plus a sweet door prize! Saturday, Oct. 29th: All Day 40th Anniversary Celebration– door prizes, Exquisite Snake Origami Project, and more! -Join our Collaborative Exquisite Snake Origami Project: led by Origamist, Kathleen Sheridan. 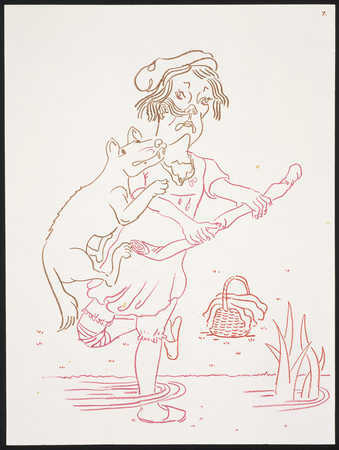 Bring in some old coloring sheets, sketches/drawings, or colorful works on paper. Once cut to a square and folded, you’ll add them to become part the giant patchwork kinetic origami snake that will wind through the store! Plus door prizes, Pocket-sized Exquisite Corpse Project, and more! -The classroom will be set up for sketching from intriguing artifacts courtesy of the Bell Museum of Natural History and more. Bring your own sketch pad and favorite tools for sketching/watercolor or use shared supplies from the classroom. Stay all day or stay for a few minutes! Drawing-friendly Door Prizes! We hope to celebrate with you at one or all of these events! Categories: Events at Wet Paint, News | Tags: 40th Anniversary, activities, events, exquisite corpse, Speedball, Wet Paint St. Paul | Permalink. At Wet Paint we are fortunate to know so many incredible artists, many of whom are also great teachers. Carl Oltvedt is one of them. Carl taught at Minnesota State University, Moorhead, where he was a Professor in the School of Visual Arts for 32 years. Back in the day, he worked for an art materials retailer in Minneapolis so his knowledge of art materials and uses is extensive. You can see some of his paintings at Groveland Gallery where he is currently represented. 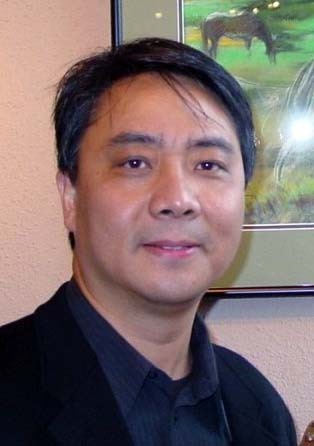 His work is in national and international private and corporate collections. He currently has his painting Reflections II on view through January 2017 in the US Embassy in Olso, Norway. Carl has a lot of credentials but he’s not intimidating…he is one of the most caring, attentive and skillful teachers you’d ever want to meet. And here’s an opportunity to do just that when you sign up for Carl’s multi session Introduction to Acrylic Painting class at Wet Paint, Tuesdays from 4:00-7:00pm, October 4th-November 1st. In this class you will learn basic painting fundamentals – how to build a painting from start to finish, simple color theory and composition, and how colors mix and relate to one another. The class starts out simply and more advanced technique is added in as the course progresses. You’ll be working from a still life. Paint and some shared supplies will be provided, though a few additional materials are required. Starting a new medium can be daunting. Acrylic colors and mediums offer a huge array of choice which can be overwhelming. So it’s great to have expert guidance, a stretch of time to absorb it all, and materials chosen with your experience in mind. I believe that real, long term enjoyment of a new medium comes from gaining knowledge of how to use the materials, combined with basic principles of art. These foundations give the aspiring artist the best chance to realize their vision. Whether you are new to painting or painted years ago and want to get back into it, there is no time like the present to begin or begin again. I hope to see you there. Click here to find out more and register online. Categories: Uncategorized | Tags: acrylic paint, Classes, events, Wet Paint St. Paul | Permalink. Three years ago I returned from a workshop all excited about a product demonstrator working with Faber-Castell. Don Colley not only knows his product line but knows how to use these materials with great nuance, sketches with daily obsession and shares his sketchbooks for mutual inspiration. 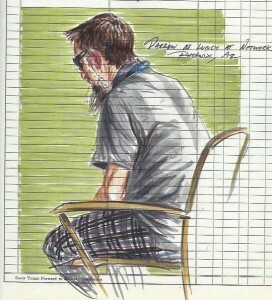 After checking his website we found Don had captured our own manager, Darin Rinne, in a sketch at a recent trade show. It seemed everything was pointing toward a great relationship between Don Colley and Wet Paint. Don has visited us many times and offered many programs with great success. This year’s visit has 3 diverse components. Hopefully one will fit into your drawing schedule. The Mini Master Class with Don Colley takes place at Wet Paint this Friday May 16th. In this small group session Don will share his drawing techniques and urban sketching strategies. 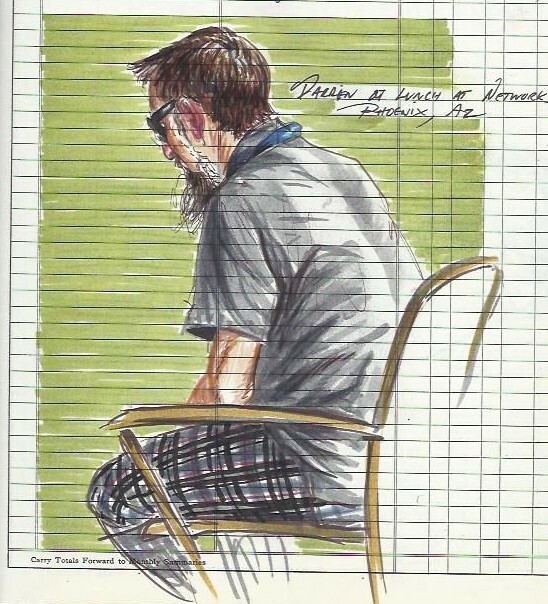 You will learn how to capture the figure in everyday settings, shading with markers and the use of the sketchbook page. Time is also set aside to share your sketchbook for individualized consultation. This workshop requires advanced registration and a fee. Space is available but limited. Saturday and Sunday Don will join Wet Paint’s mini-store at SpringCon, the Midwest Comic Book Association’s spring celebration at the State Fair Grounds. Besides being available all day for drawing and chat, Don has a “Big Drawing Session” 4-5 on Saturday. There will be live costumed characters to draw and everyone is encouraged to join in this drawing session. Just show a sign at the ticket booth that says “I’m here to draw with Don Colley” and you will get $1 off the admission price. You may also donate your drawing to the charity auction where 100% of the proceeds benefit the Minnesota Lupus Foundation. 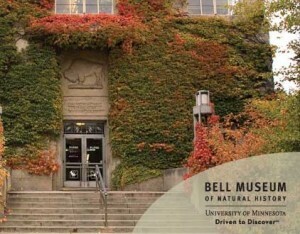 Don has created his own night at the museum with the Bell at the U of MN on Monday May 19th. This is the last day of the Minnesota legislative session which will determine funding for a new home for the Bell, so this event may have some editorial content. Join Don for an all-night sketch-a-thon. Bring your sketching materials as well as camping gear. Contact Wet Paint or the Bell Museum for entry time and further details. As you can tell from this lineup, Don is an artist with extreme talent, a true sense of artistic adventure, limitless energy and a big heart. It’s just the right time for you to collaborate with Don at Wet Paint, SpringCon and/or the Bell Museum. Categories: Events at Wet Paint, News | Tags: Bell Museum of Natural History, Don Colley, events, Faber-Castell, Midwest Comic Book Association, Pitt Artist Pens, SpringCon, Wet Paint St. Paul | Permalink. If you were to ask Darin, General Manager at Wet Paint, what customers ask for the most that we don’t provide, it would be “classes.” Besides not having classroom space, we at Wet Paint also believe the Twin Cities offer many options for further artistic learning. We have come up with some unique partnerships to connect those who manufacture art supplies with a number of organizations to bring new learning experiences to our customers and our community. There are a number of classes and workshops we have helped develop this October featured at existing educational venues with our friends in the art materials industry, our customers and the Twin Cities community. St Paul Community Education still has space open in “Almost Intermediate Drawing & Color Pencil” with Mary Esch. An internationally recognized artist who has art in the Walker Art Center’s permanent collection, Mary Esch worked at Wet Paint a long, long time ago. This is a hidden gem of an opportunity to work with this talented artist at Community Ed prices. The class is held Monday evenings at Creative Arts High School. Another Community Ed opportunity is “Open Studio Painting” with Dan Mackerman starting October 9th at Edgcumbe Rec Center. Professional artist Mackerman will help beginning artists decide which is the best wet media for them. This is a way to experiment with watercolor, acrylic and oil without having to purchase 3 ranges of color. Brian Buell, president of Logan Graphic Products will teach a ½ day class on DIY mat cutting. 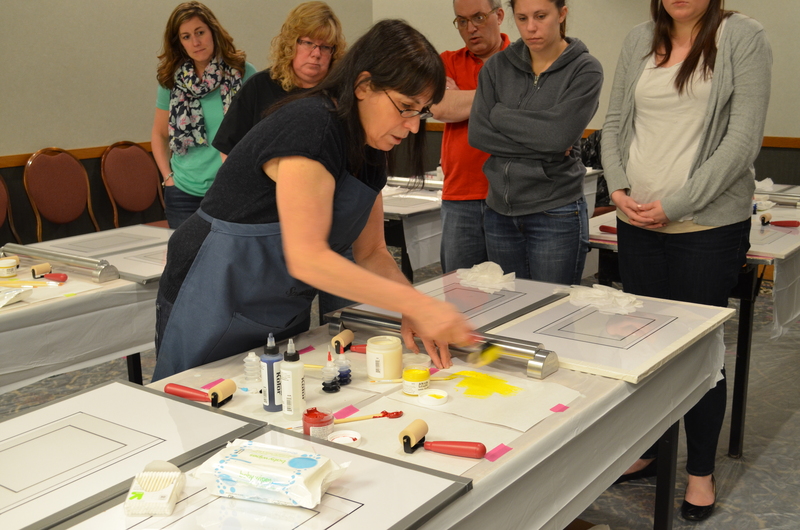 The class, held at Macalester College on October 26th, will take you through border calculation, mounting and cutting both single and double mats. Brian comes armed with mat cutters and materials for everyone in class to have hands on training. This workshop is also part of St Paul’s Community Ed. Click here to see the entire Community Education Catalog! Wet Paint is pleased to bring Susan Rostow, founder of Akua Inks to the Twin Cities. Susan became concerned about health safety issues surrounding printmaking and created soy based printing inks which are highly regarded in college printmaking departments. Besides offering a free talk at Wet Paint the evening of October 11th, Rostow is teaching a workshop at Highpoint Center for Printmaking on Saturday October 12th. At this writing, there are still some spots open in this workshop. Read more here! Yuming Zhu, master of Sumi painting, has come to the Twin Cities for a number of years doing demos at Wet Paint and teaching workshops at some of the art centers in the area. October 29 and 30, Yuming will teach a two-day workshop called Golden Leaves at White Bear Center for the Arts. Yuming is a mesmerizing teacher and quite witty, too. This is a way to experience White Bear Center for the Arts’ new building which I saw last week and it is fantastic. Read more here! All these classes have fees and registration through the organizations presenting the classes and workshops. Wet Paint is happy that we can pool our resources and bring these opportunities to our community. Categories: News | Tags: Akua Ink, Art education, arts, Brian Buell, Dan Mackerman, event, events, Highpoint Center for Printmaking, Logan Framing, Mary Esch, St. Paul Community Education, Susan Rostow, Wet Paint, White Bear Center for the Arts, Yuming Zhu | Permalink. Who would have thought that July would become a hot soft pastel month? Out at BTAC (Bloomington Theater and Art Center) our friends with the Lake Country Pastel Society have presented a wonderful member show called “Make Your Mark.” Over 40 artists represent an amazing breadth of imagery and technique using soft pastels. There are landscapes that are distinctly Minnesotan, as well as several that remind me of a recent road trip to the Pacific Northwest. There are portraits, one of which incorporates new media by starting with a digital photo. There is an abstract image that pushes the boundaries of both the stick and the surface: pastel – a media with little adhesive property- adhered to the slick surface of Yupo with water. There is subject matter for any taste. And it is amazing to see one medium that can create such different results from the density of oil to the airiness of watercolor. It was a real treat to be at the opening reception with so many of the exhibiting artists in attendance. They were truly thrilled with the exhibit as well as being down right verbose about their artistic pursuits, their influences and their techniques. The show is up through August 23. A presentation of awards by the juror, Albert Handell, will take place Tuesday, August 6th, at 6:30 p.m. If you haven’t seen the great gallery space at BTAC, this is a perfect opportunity to remedy that situation. Also in pastel, but in a vastly different format, Shawn McCann takes the centuries old Trompe l’oeil technique and his box of soft pastels to the street. 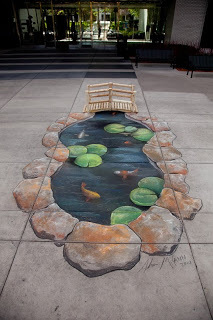 Shawn will be at Wet Paint this Saturday, July 27th, from 11 a.m. to 3 p.m. creating an illusory image on our sidewalk with Jack Richeson’s new big, fat soft pastels called Street Stix. I have to admit that soft pastels haven’t been considered the cutting edge medium in recent years. But 3D street painting brings pastel paintings out of the flat files and museums and into the contemporary art gallery space shared with aerosol painting and stenciling. Just as the Lake Country Pastel Society has a pastel painting to appeal to any esthetic, McCann’s street art will appeal to everyone’s in its populist presentation. Categories: Events at Wet Paint | Tags: Bloomington Theater and Art Center, events, exhibition, Lake Country Pastel Society, Shawn McCann, soft pastel, Street Stix, Wet Paint St. Paul | Permalink.